Availability: *** Please allow 5-14 days for delivery. CAN BE SOONER! 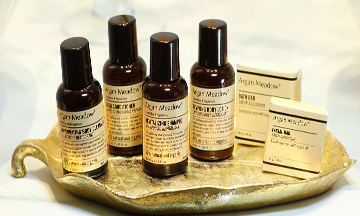 THE Argan Meadows Collection. The Eucaliptus & Peppermint Argan Meadow´s line of amenities is based on natural ingredients for body and hair care: Organic Argan Oil, Aloe Vera Extract and Green Mandarin Oil. Its composition based on purer essential oils, provides the maximum care and hydration for the skin. Its aroma of Mint and Eucalyptus leaves a feeling of freshness and comfort unique to the body. This collection is also perfect for those accommodations in which you would like to add a touch of distinction without giving up warmth and charm.